Whessoe carried out the detailed design of two 18,000m3 Ethylene tanks and two 13,000m3 Propylene tanks to a 5m battery limit. The Ethylene inner tank was constructed of 9% Nickel steel while the Propylene inner tank utilised low temperature carbon steel. Both tanks incorporated a spill collection system and fire protection systems. 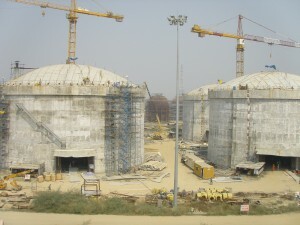 The Ethylene and Propylene tanks were design to API 620/BS7777, however some specifications were tailored to Indian codes so that locally supplied materials could be used. Process safety was designed using NFPA 59A codes. The engineering was completed within ten months followed by a construction period (by others) of thirty six months which included ground improvement, fabrication on site, construction, testing and commissioning. Whessoe provided a Construction Advisor at site during all phases of the work from piling to commissioning of the tanks.